We are in high fruit season in the Washington, DC area, with fresh strawberries, blueberries, blackberries and especially peaches waiting to be picked and devoured. I found myself with an abundance of strawberries and blueberries this past weekend, and wanted to find a summery, dessert use to which they could be put. After looking through a number of recipes, I cobbled together bits and pieces and came up with this one for a cool, refreshing summer dessert full of these fruits - a tart using a faux marscapone and a glaze made from a small amount of jam I made with extra strawberries and blueberries. It's a delight - and easy to boot! This makes a single 10" tart. Total fruit used was 1 lb of strawberries and 1 lb of blueberries. In food processor mix flour, salt and sugar. Add butter cut into 1/4" pieces and blend just enough to achieve a course mixture. Whisk together the egg, water and almond extract and drizzle into mixture while pulsing. Once the dough forms a ball, stop and wrap in plastic and refrigerate for 30 minutes to 1 hour. Cut strawberries in roughly halves and reserve the pointed tops for the final fruit layer. Place strawberries and blueberries in food processor and chop - but don't puree. Place the fruit, sugar and lemon juice in a pan and bring to a boil, stirring frequently until the sugar is melted. Bring to a roiling boil and maintain for about 10 minutes or until mixture reaches 220°F. Remove from heat and cool. Strain through a sieve enough of the mixture to yield about 1/4 cup of liquid which is reserved for the glaze. The remainder can be refrigerated and used on those wonderful breads you're baking for breakfast toast! Roll the chilled dough out on a floured counter to a diameter of about 11". Spray tart dish with Pam or a substitute, dock dough with a fork and bake in a preheated oven at 375°F for about 25 minutes, until nicely browned. Allow to cool and remove from tart dish. Spoon the chilled faux marscapone mixture into the tart. Arrange remaining 1/2 lb strawberries and 1/2 lb blueberries in the mixture. Heat the 1/4 cup of jam glaze and brush over the tart. Chill and serve! Easy and a great way to celebrate some of summer's fruitful delights. With a new baking job I've been overwhelmed to the point of hardly having time to enjoy posts on TFL let alone contribute. But as the 4th has approached I found a day off to recharge my batteries, revisit some breads I love to bake, and try an experiment in dinner rolls involving ciabatta dough. First, revisiting old friends - in this case Hamelman's mixed starter pain au levain, and, fougasse. Over time I've found that the subtle flavors that are imparted by a mixed starter of my everyday levain and rye levain, combined with a small introduction of whole wheat flour to the final dough, make this pain au levain my go-to bread of choice. 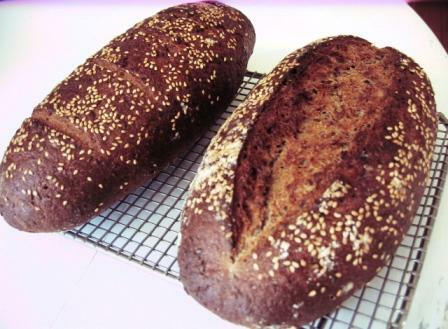 There is noticeable sourness in the baked loaf, yet not so overwhelming that it obscures the other flavors imparted by the mixture of grains and starters. Plus, I have to admit, it's just plain fun to be able to use both starters simultaneously in constructing one dough. Usually I find myself grabbing one or the other starters out of the fridge (now that it's unbearable summer here in D.C.) and staring somewhat ruefully at the one which goes unused. So Hamelman's mixed starter sourdough not only satisfies my taste buds, but assuages any sense of guilt over favoring one levain over the other. The fougasse I haven't baked in some time, but I had promised compatriots at my favorite pub that on Saturday I would appear with snacks in hand. 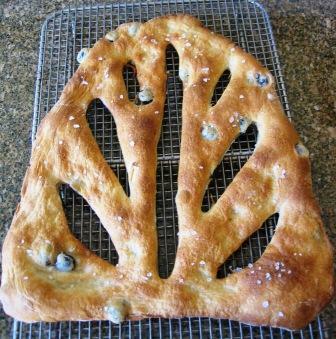 And what better way to share than with a niçoise olive and sea salt fougasse! The beautiful leaf shape was shortly admired and much more rapidly dismantled by my fellow pub mates! I've tried these with a variety of additions - roasted garlic, sun-dried tomatoes, and traditional anchovies. In any incarnation, I find them quickly devoured. And let's face it, they are a 'fun' bread because of their distinctive shape. 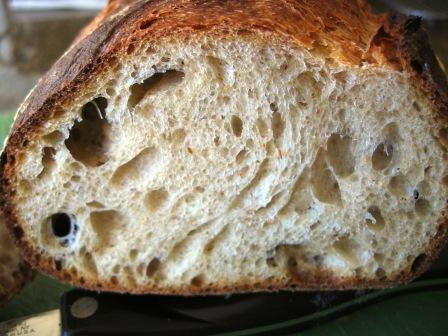 My third bake on Saturday was with a traditional ciabatta dough of 72% hydration. But instead of creating the usual 1 lb. loaves I decided to cut the dough into 1.5 oz increments and bake dinner rolls with them - ciabattinis as I like to call them. The dough makes for a quick and easy dinner roll that can be bagged and frozen once cooled, ready to be pulled out and thawed as needed. 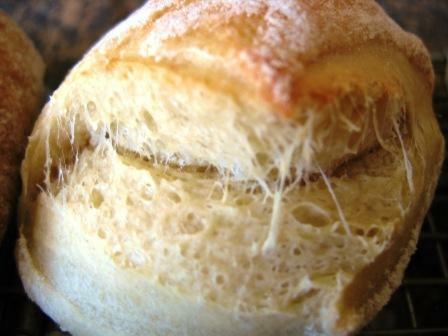 Most of my dinner rolls contain healthy doses of butter, so I find this very simple roll - just flour, water, salt and yeast - to be a nice change and a wonderful sop for any dish that contains oils or juices. The other eventful recent occurrence was a delightful 2-day workshop at King Arthur Flour in mid-June on wood-fired oven baking, taught by Dan Wing who, with Alan Scott, wrote the 'bible' on wfo's - The Bread Builders. It was an eye-opener for me in that my conceptions of wfo's as mainly pizza makers were thrown out the window as we not only baked wonderful breads, but cooked equally wonderful meals on them. Those who are interested in reading more about my second 'excellent adventure at KAF' can find my recounting here. Happy baking and Happy 4th of July to all! I love fresh bagels and croissants, but being a household of one, these present a challenge: I can't (and more important, shouldn't) sit down and eat my way through a half dozen at a time. 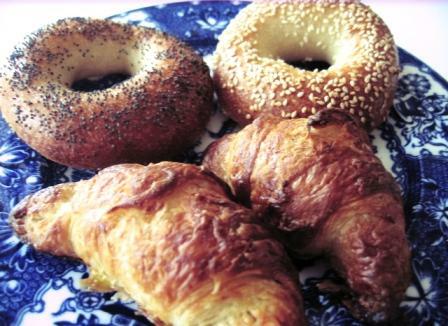 The other side of the challenge is the impracticality of making up either dough for just a couple bagels or croissants. The solution that sort of forced itself upon me, but which I like more and more, involves making each dough up and then freezing it and taking out what I need the night before, where I allow both to thaw in my refrigerator. An early attempt at freezing fully proofed croissants and pains au chocolat that I wrote about failed because I tried baking them without allowing much thawing at all. 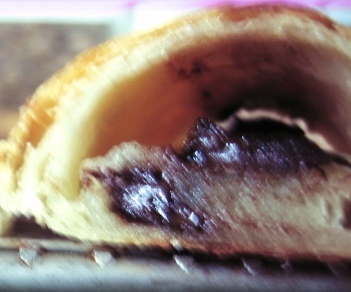 I found that fully proofed croissants will rise nicely if they're given a hour or two at room temperature after being thawed in the 'fridge, but this won't work for pains au chocolat which lack enough yeast power to rise around the chocolate batons. So I've taken to shaping croissants and pains au chocolat and then freezing them immediately. The only drawback is that they need close to 3 hours at room temperature after being taken out of the refrigerator before they've risen sufficiently. Bagels, on the other hand, are easy. You simply shape them, allow them to fully proof, and then freeze. The day before I want some, I just take a couple out of the freezer and put them into the refrigerator where I allow them to stay until I'm ready to boil them. So, today I decided that a carboholic brunch was in order - why not some of each? 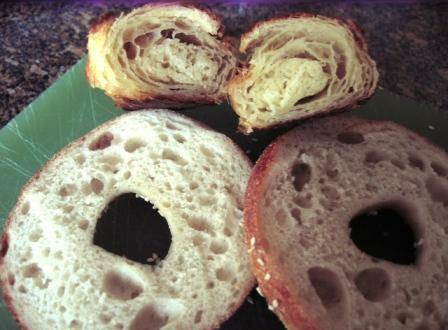 The bagels were boiled in water with some honey for their sheen and a little salt. A 45 second boil on each side and then topped with sesame and poppy seeds and allowed to dry for about 5 minutes. Then into a hot oven (about 480 F) for 15 minutes and voilà! 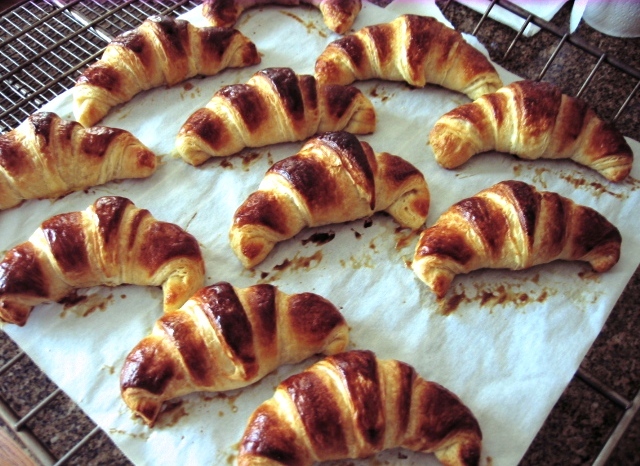 The 3 hours the croissants needed were perfect for brunch-time. 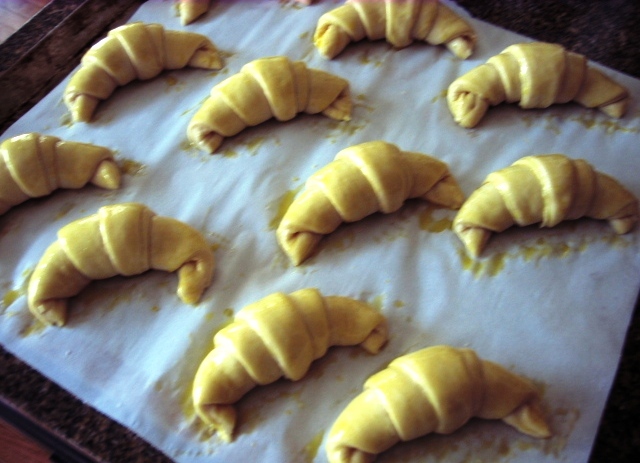 As you can see, the shaping of the croissants is pug-ugly (apologies to pug owners), but the lamination looked pretty good to me. And they are deliciously decadent - no need for butter! 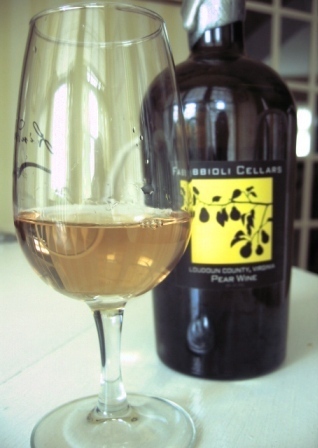 Mimosas are my usual brunch drink of choice, but I picked up a wonderful bottle of a pear 'port' from a local vineyard (Fabbioli Vineyards) that they made blending their own pear wine with pear brandy that my friends at Catoctin Creek Distillery made for them using Fabbioli's pear wine. (I can't wait to try the brandy!). Who says port has to be an après dîner affair? All in all a splendid brunch that has me carbo-loaded for the day. There is rye, and then there is rye. The chief difference is this: with one you bake with and the other you distill. The ingredients (not surprisingly) are remarkably similar, as is the process in many respects. And both finished products are equally capable of eliciting hurrahs! This past weekend I was fortunate to be able to straddle both worlds. 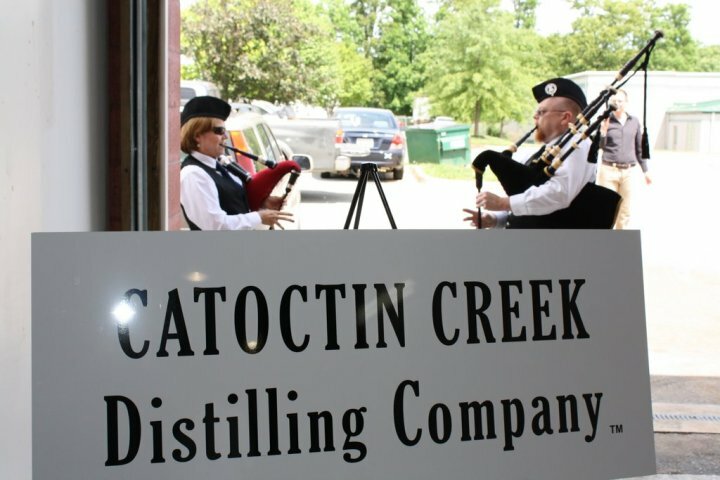 And that was followed this past Friday,with a Grand Opening of the Catoctin Creek Distilling Company. It was a wonderful affair, full of bagpipes (Scott and Becky both claim Scottish heritage, including a fondness for Robert Burns that culminates yearly in a dinner in his honor accompanied with much fine Scotch and haggis - I myself draw the line at scrapple). And there were friends and governmental officieries to boot! 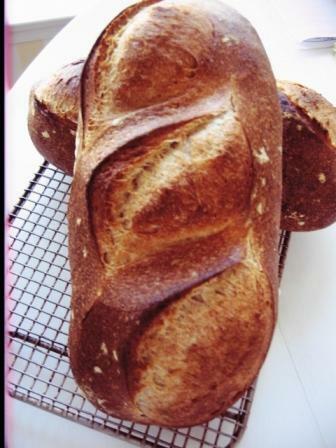 Now, what is interesting for us bakers, is that they are producing both rye and gin from organic rye flour courtesy of Heartland Mill in Kansas (are you there proth5?). Each batch of mash is made using 700 lbs. 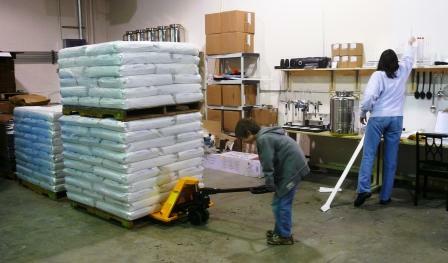 of rye flour (that's 14 bags of 50# flour) which is brought up to the mouth of the cooker using a forklift. In addition to water, various enzymes are added - amalyze being prominent - and then yeast which goes completely wild. The resulting 'porridge' after 12 hours is sweet and very reminiscent of gingerbread. From there the liquid is pumped into the still, while the leftover solids are given to local farmers who use it to produce 'happy' cows and 'happy' pigs. 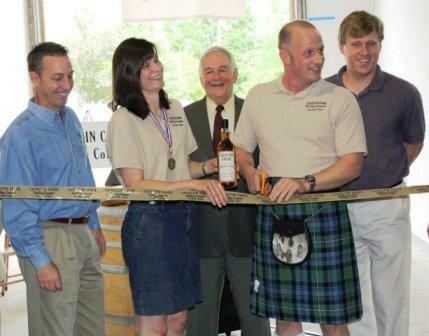 Well, it was obvious to me that the only fitting present for the Grand Opening was a loaf of, what else, rye? 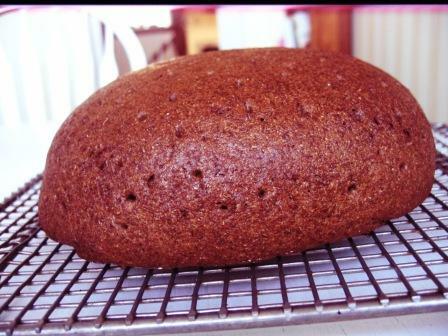 So I baked flaxseed rye from Hamelman's Bread. I made two loaves and scored one with a straight cut and the other with a sausage cut. The next day, Saturday, a bunch of us volunteers returned to bottle 360 bottles of Roundstone Rye in a little over 2 hours. For those of you interested in seeing how a micro-distillery works, you can watch this. 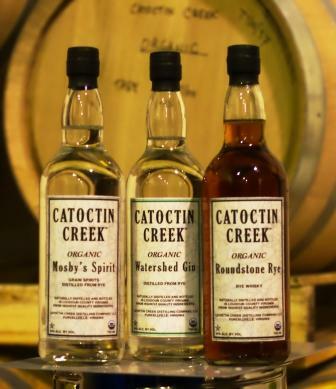 In an unabashed plug I'll note that Scott and Becky just a little over a week ago were awarded a bronze medal in a competition sponsored by the American Distilling Institute for their un-casked Mosby's Spirit Rye. Rye and rye, bread and whiskey. Is it any wonder we celebrate these gifts of nature! 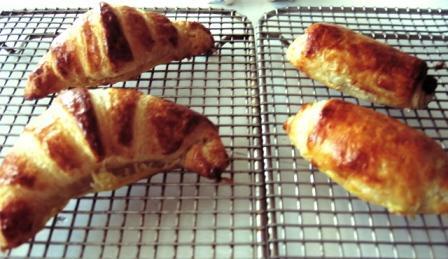 This weekend I decided to have a second go at croissants and pains au chocolat. I used a recipe that Julia Child had featured with a guest on her show, and which DonD helpfully included in his blog here (it appears as a two-part video). The written recipe sans video can be found here. 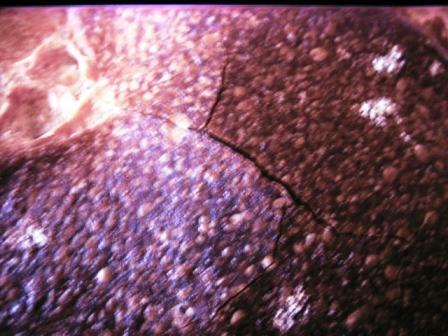 I also benefited from a nice explanation and accompanying video of the lamination process that ananda posted here . I found that the process of laminating the dough seemed to go smoother this time - less hesitation which causes the dough and butter to warm. I used what I have come to understand from ananda as the British method (vs. the French method) to initially incorporate butter into the dough (which had retarded for 24 hours), by rolling out the buttter to a rectangle 2/3'ds the length of the rectangle of dough. You then execute a letter fold by thirds, beginning with folding the dough not covered with butter over the butter. Aside from it being an easier method, I like the fact that the it yields a dough that now has two layers of butter prior to your intial folds/turns. 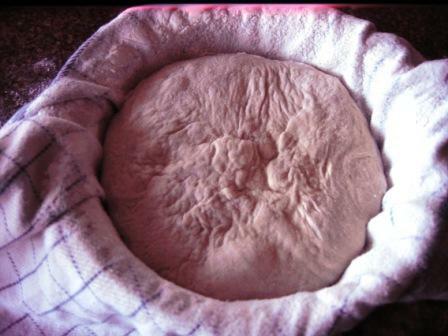 After completing the three folds, the dough was refrigerated overnight. 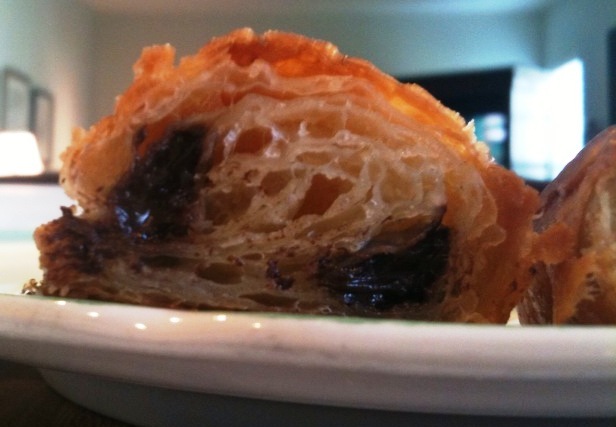 Next morning I cut it into 2 pieces, returned one to the refrigerator (it would become pains au chocolat), and began rolling out the other piece to create croissants. 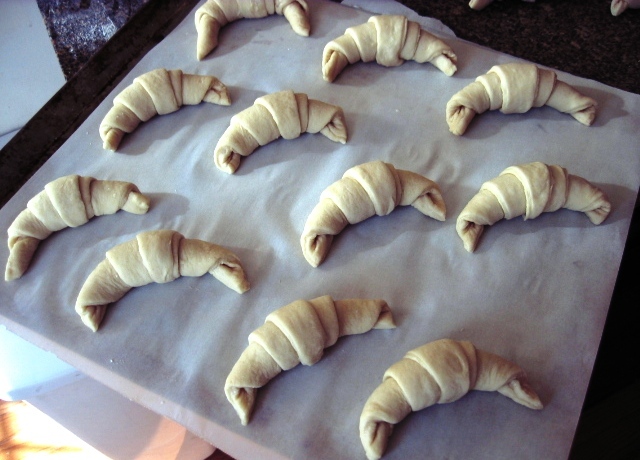 Julia's recipe will produce about 14 croissants that are 4 1/2" wide and 7" in height. Forming the croissants, as I'm discovering, is much like learning to shape baguettes: it takes a lot of repetition to get it right. 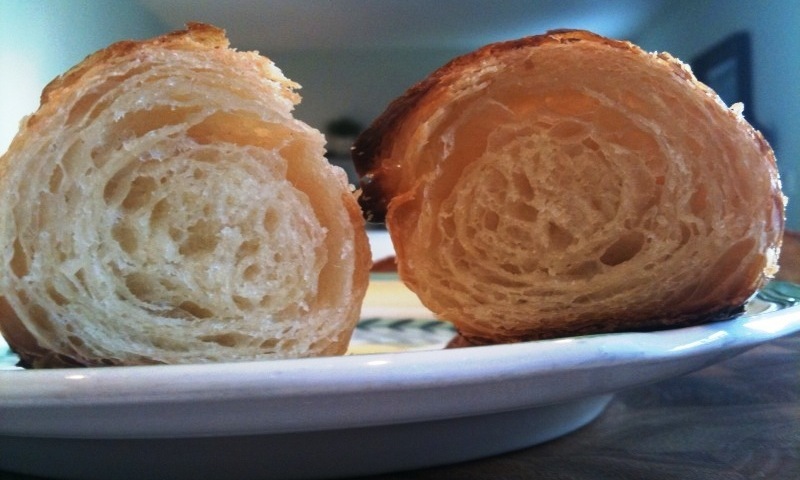 Crucial to achieving many layers is a stretching of the croissant triangle after it's cut. The base is stretched out by about 1", and the height is stretched considerably. 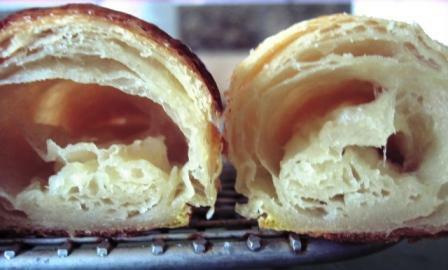 I've read that a well-formed croissant should have at least 6 visible layers. 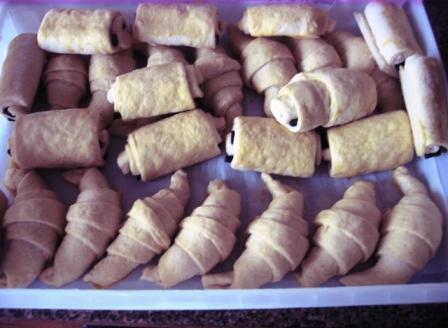 I managed to achieve this on about 1/3 of the croissants I rolled - the others came out at 5 layers. 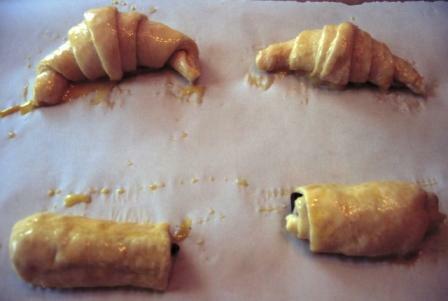 After the croissants were shaped I eggwashed and proofed them for three hours, and began shaping the pains au chocolat. I used two chocolat batons (I use the less expensive Callebaut, rather than the Valrhona DonD prefers - I figure I'm on training wheels here, so I'll work up to the really good chocolate) per pain, and also allowed them to proof for 3 hours after an eggwash. At the end of the proof I proceeded to freeze both batches (see below). Today I pulled out a couple of each, preheated my oven to 350° F, and applied a second coat of eggwash. Total bake time was 20 minutes. Both looked nice immediately after the bake - good color and nice puffiness. After letting them cool I cut them, and uh....well...the pictures speak for themselves. Obviously I have a BIG problem with the layers not rising. Not sure what the potential causes were, so I'm looking for any and all feedback (jump in Don and Andy!). I did pay particular attention during the lamination process to not letting the dough get warm, and placing it back in the refrigerator as needed to allow it to relax before rolling out further. So I don't think that's the issue. Could this be a yeast problem? In any event, I have approximately 325 Callebaut chocolate batons stored in a cool place, so plenty of practice ammunition! In the meantime, I need some pointers! 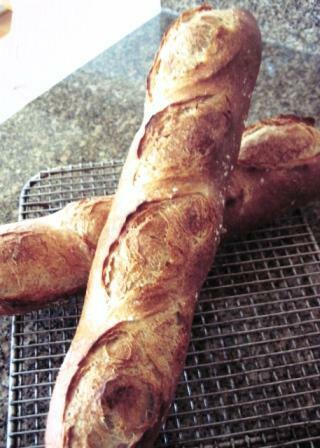 I love baguettes. I love them for the challenge but even more for the complexity of flavor that can be developed. 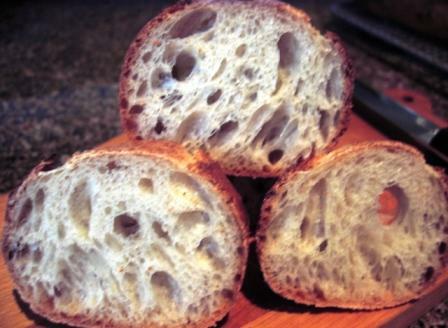 My two favorites are Hamelman's poolish baguette and Sam Fromartz's Parisian baguette that gains so much from the addition of just a small amount of whole wheat flour and sourdough. So having drooled over first DonD's blog on his attempt to marry his two personal favorites, and then having to tie a bib around my neck after reading (and seeing!) David's attempt at Don's baguettes, there was no drool left in me and nothing to do but try these to see what they would deliver in taste. I ended up doing two bakes over the course of a week. I wasn't quite satisfied with the results of the first (I'll get to that), so I tweaked things a bit and ... well, we'll get to that also. On my first bake, during the final dough mix I went for a slightly longer mixing period - 4 minutes on speed 1 and another 5 minutes on speed 2 (my little Hamilton Beach would have to work a very long time to overmix dough). I also opted to do 3 folds at 45 minute intervals during the 3 hour bulk fermentation, having read David's account of the amount of rise he got during the overnight retardation. 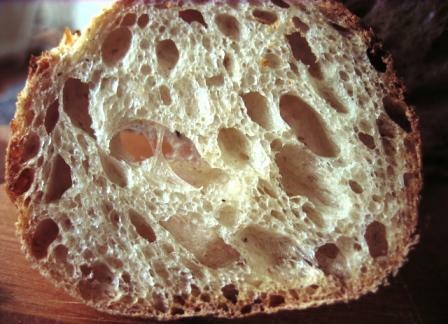 The results were ok, I think the crumb was relatively open and my cuts opened enough to allow additional rise. 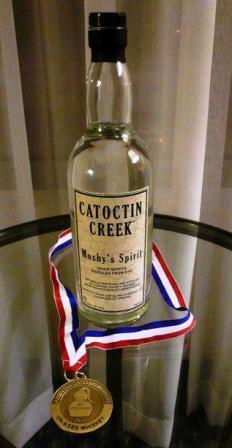 But for my taste I thought the flavor showed a little too much of the rye. In any event, two baguettes can be consumed quickly, so I had sufficient reason to repeat the experiment with a few changes. In bake #2 I made two changes to the formula - one intentionally and one, well, not, along with one procedural change. I reduced the percentage of rye to 6%, so in my case that meant adding only 30g of rye instead of the 50g called for. However, in my enthusiasm, I neglected to increase my AP (Sir Galahad) by 20g. This I realized, of course, after I had mixed the dough and autolysed it in the refrigerator. Ok, so now I'm working with a 78% hydrated dough which would normally cause me to break out in a cold sweat; however, one of the beautiful aspects of this bread is that because the dough is shaped after an overnight retardation, it is much, much easier to handle and score than a 78% hydration dough mixed, proofed and shaped at room temperature. 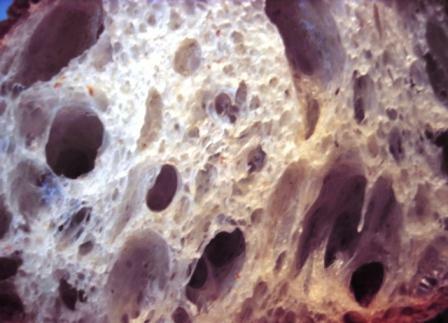 (Frankly, I'm not sure I'd even attempt to score such a highly hydrated dough under normal circumstances). Procedurally, I decided to do my initial mix in the morning. I then autolysed the dough for 6 hours in the refrigerator instead of overnight. (Hey, one person's overnight might be only 6 hours, who's to say?). This allowed me to do the final dough mix in late afternoon, and to put the finished dough to bed for the night just ahead of me. Next morning I divided the dough, bench rested for an hour, shaped and did final proofing for 45 minutes, and the finished product was out of the oven by 10:30am - a little more than 24 hours from the initial dough mix. 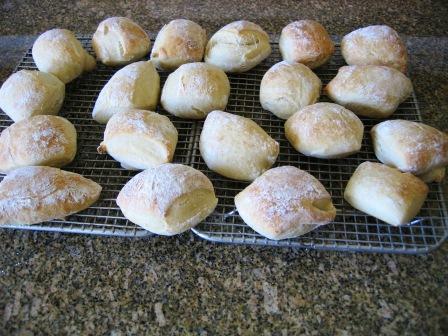 Anyhow, here are the results of bake #2. I'm more pleased with the second bake, both in terms of appearance and flavor. The rye still comes through, but it is not quite as pronounced. Interestingly, the second bake tasted sweeter to me than the first, although both bakes came out well caramelized. So, bottom line, good taste, good crunch, good crumb! 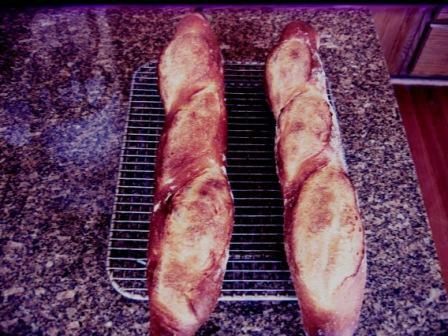 And I now have three favorite baguettes thanks to dmsnyder à la DonD. Edit: (Tip o' the hat to Andy) - I forgot to mention that I withheld 50g of water from the autolyse which I then incorporated along with the salt and yeast during the final dough mix the next day. DonD and ananda had a long discussion about this technique which can be found here. The cold dough (which has developed some gluten structure) does not easily accept additional water, but in the 4 minutes I mixed on speed 1 it pretty well incorporated it). Bread baking really is a lot like the Wide World of Sports. A really nice bake that lulls you into thinking you've 'conquered' a particular bread is often followed by a rude reality slap when a bake goes awry, leaving me, at any rate, wondering whether the former was just a lucky fluke or the latter a bad day. Rarely do I experience both the high and low in a single day, but today's bakes managed to fill the bill. 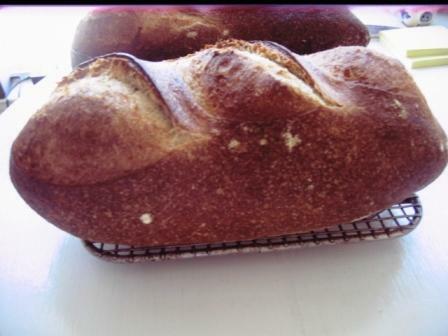 I began with an attempt at Hamelman's Three-Stage 90 Percent Sourdough Rye. I've only been baking ryes for a little over a month, and I've been dutifully working up from fairly low percentage ryes to progressively higher ones. This one was the second Detmolder method rye I've attempted (the first being a 50% rye which turned out quite nicely). Everything had gone well through the various builds, until the final mix. 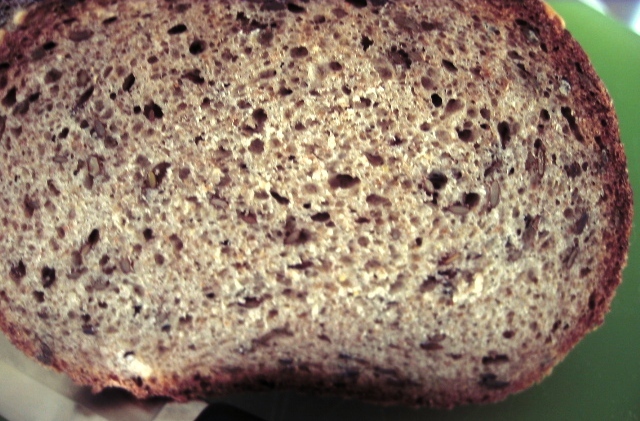 Then, I found (retrospectively), I had misread his final dough amount of medium rye - 1 lb, .7oz (that's point 7 oz) as 1 lb, 7 oz! Not good. (Should I mention that I'm waiting on a new pair of reading glasses?). I should have known immediately when I began the mix that the dough was way too dry for a rye. But I continued the mix, and only after did I go back and redo all my calculations, eventually leading me to discover that it wasn't my math that was faulty, but my eyesight. In desperation, I put the finished dough back in the mixer, and added the appropriate amount of water to compensate, mixed briefly on speed 1 and then proofed as per recipe. 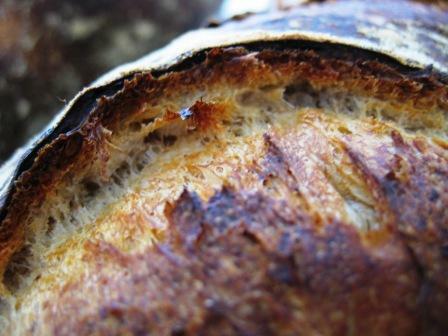 Meantime, I had also mixed Hamelman's Pain au Levain with 5% rye, which I love for its subtle but distinct flavor. I've slightly downsized his home recipe to make two 1.5 lb loaves. I find that the finished product is about 11" long, weighs about 1 lb, 4 oz after baking, and is a perfect size (to me!). The two bâtards were comfortably resting en couche, but it was now obvious to me that they would reach near-full proof too early given that the rye needed to go into the oven first but was now seriously behind schedule given my disastrous mishap. I decided to retard the pain au levain in the refrigerator and hope that I wouldn't end up with an over-proofed product. The rye went into the oven, after docking, for a 50 minute bake. As you can see, I might be able to sell the finished product to a sporting goods store as an 'organic discus'. Ah the agony of defeat. This left me with two loaves of pain au levain to bake and hopes for some kind of redemption. The retarding, which I haven't tried with this bread before (Hamelman discourages overnight retarding, and I've never tried short-time retarding) I think helped the scoring markedly. 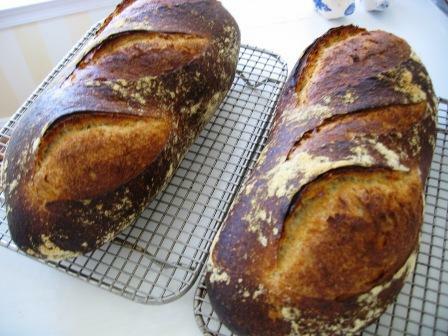 But the proof of the pudding came 40 minutes later when I pulled the two loaves from the oven. These had the best oven spring by far that I've ever achieved with this bread, as is evidenced by the gringes (also the best I've managed with it)! And - to top it all off - the crust after a couple minutes out of the oven began to crackle and continued to do so for the next hour! Ah, the thrill of victory! All in a day's baking. So I again wonder, how much luck, how much misfortune, how much skill? 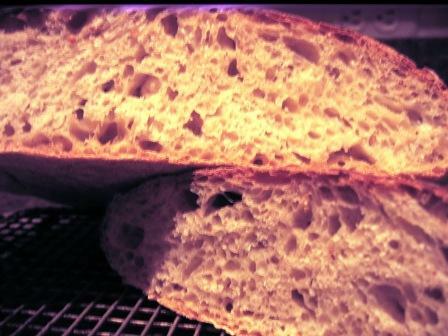 Something to reflect on over a nice piece of freshly baked bread! It's not often that someone can lay claim to producing the best baguettes in a city, but in Washington, DC Sam Fromartz has done so, thanks to a competition sponsored by a local publication - the Washington City Paper. 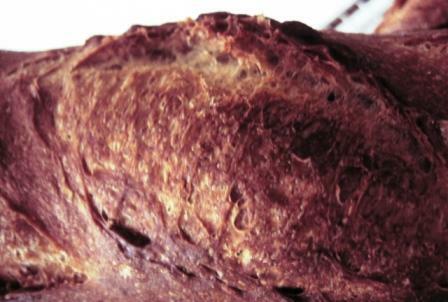 The competition, held in 2009, challenged metro-area bakeries to submit baguettes which were then blind tasted by a panel of experts, including Mark Furstenberg, who introduced artisan bread baking to DC. What the experts didn't know was that Fromartz, a writer by trade but a bread enthusiast, had submitted his own home-baked baguettes as well. 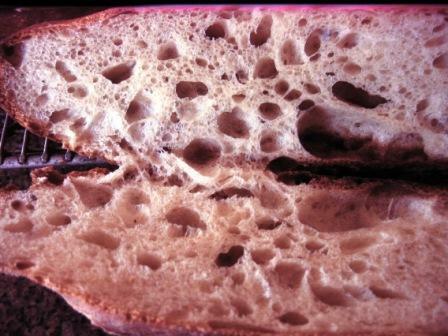 When the dust settled, the judges had awarded perfect scores to the two loaves baked by Fromartz. The following will produce two 16" baguettes weighing in at around 280g apiece. Day 1: Begin by adding the starter and water and mixing to break up the starter. Fromartz adds his yeast as well, but because I use instant dry I instead mix it into the flour. To the liquid mixture add the flour and salt. Fromartz mixes by hand and uses the slap-and-fold technique to knead. I initially followed this method, but my last bake produced great results using my stand mixer and left me with clean hands to boot! (I mixed 4 minutes on speed 1 and 4 minutes on speed 2, which produces a dough with moderate gluten development). Place the dough into a lightly oiled container and cover. It then receives 3 folds at 20 minute intervals. After the final fold, place again in covered container and retard overnight in the refrigerator. Day 2: Preheat oven to 470°. Remove dough from the refrigerator. 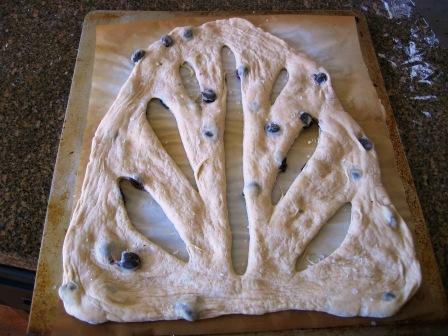 Fromartz immediately divides and pre-shapes, but I allow the dough to sit for about 1 hour before dividing. After dividing and pre-shaping I let the two pieces of dough bench rest for about 30 minutes before shaping into two 16" baguettes. I couched them, seam side up, for an hour, before placing them on a parchment-covered peel and scoring them. I pre-steamed my gas oven with about 1/4 cup of water, and then immediately after placing the baguettes on my baking stone I carefully added 3/4 cup of water to lava rocks that I have piled up in a cast iron skillet at the bottom of my oven. Bake for 18 - 20 minutes. Because of the overnight retardation, these have a rich crust with almost a reddish coloration. The flavor of these is truly wonderful. 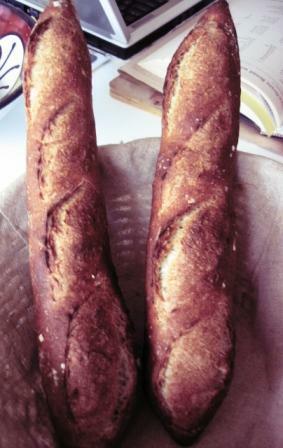 The small addition of whole wheat flour and sourdough gives them a nuttiness that I've only found in poolish baguettes. 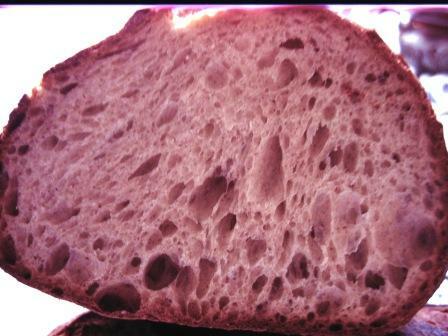 I was pleased with my slashes (despite the problems gas ovens create by venting steam), and the crumb was the most open I've achieved with his recipe. 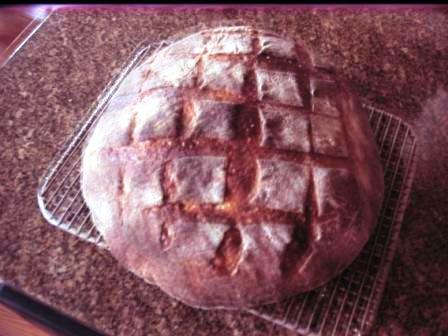 So - want to enter your own competition with Sam Fromartz - then give his award-winning recipe a shot! Edit: Oops! Don't know where my head was when calculating bakers percentage, but AP is 98% and whole wheat is 2%. This weekend I decided to try Hamelman's Country Bread in the shape of a boule. However, I lack proofing baskets, and as I proceeded through the recipe, a nagging thought kept injecting itself: So, how do plan on keeping your boule from turning into a pancake? 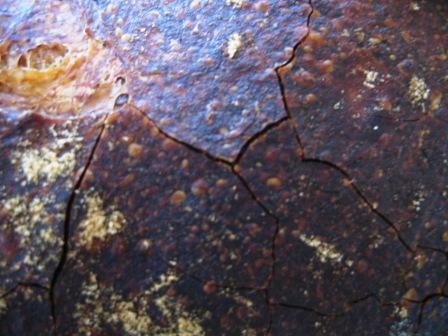 The pâte fermentée is made up 12 - 16 hours prior to the final dough. Final mixing involves incorporating all ingredients except the pâte fermentée on speed one, and then cutting in the pre-ferment in chunks as the dough comes together. Increase to speed two and continue for 2 - 3 minutes (or longer). 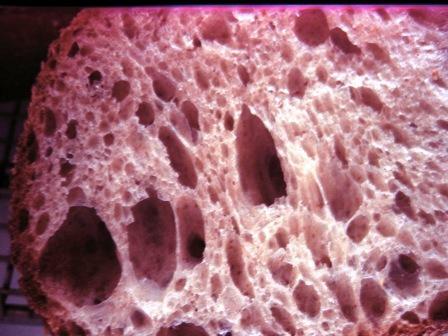 Hamelman's description of the final dough is "supple and moderately loose, with moderate gluten development." 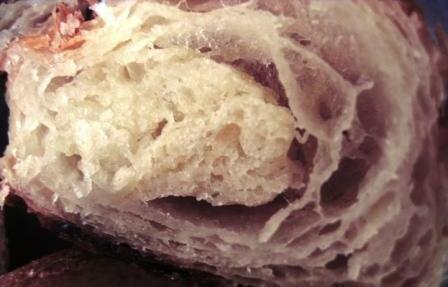 My own experience was that while the dough had developed some strength, it was still relatively slack. 2 1/2 hours, with two folds at 50 minute intervals. Pre-shape, cover with plastic and bench rest for about 20 minutes. 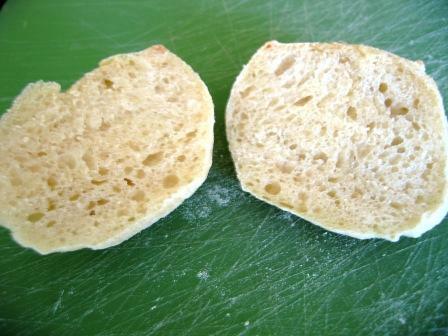 Final shaping into boules is followed by placing the loaf into a floured banneton or a couche. Final fermentation is approximately 1 1/4 to 1 1/2 hour. Bake is at 450° in a pre-steamed oven that is steamed again once the loaf is loaded. Baking time is approximately 35 minutes. The moment of truth for me came at the shaping stage when I had to decide what to do with this boule I had created. 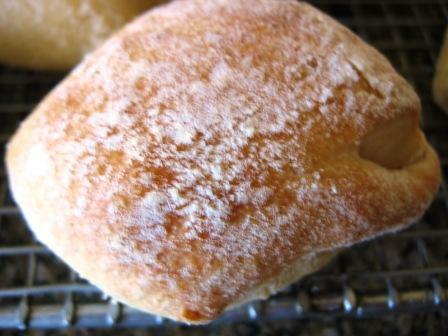 It was clear to me that with a final fermentation time of an hour or longer, even a tightly shaped boule would begin to imitate ciabatta dough, and I do not have any bannetons. 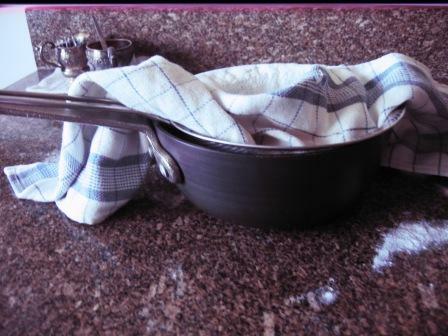 But as I surveyed my kitchen, it occured to me that I did have a fairly sturdy sieve, into which I could fit a floured tea towel. 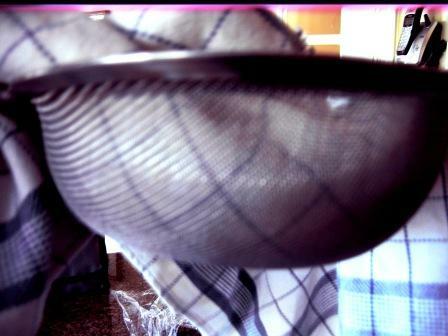 That revelation then raised the question, how to suspend the sieve so that it was level/ A 2 qt. calphalon pot volunteered and I glimpsed a true jury rigged solution to my problem. I heavily floured the tea towel with rice flour, which I've discovered is much less absorbent than AP - I haven't had anything stick to surfaces I've dusted with rice flour and this was no exception. The result is a boule which, though it spread some in the oven, does not resemble the pancake I had dreaded as I began my project. 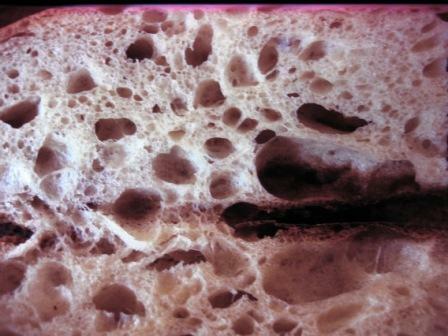 The country bread has a pleasing taste - thanks to the pre-ferment - and makes a nice (if not so wide) sandwich bread. Meanwhile I've made a note to add bannetons to my Christmas list. But in the meanwhile, I'm happy with my sieve and makeshift proofing method!